It was the same as the Flurries of Flour menu from March 18ththrough the 22ndfor both the baby and me. Although apparently the baby has decided she doesn’t like eggs anymore, so now mama has to figure out what else to give her. 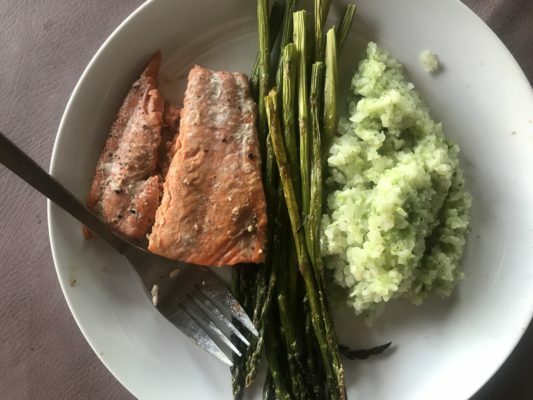 I wanted something quick, easy, simple, and something that would actually fill me up (last week’s lunches honestly made my blood sugar a little wonky). I made sandwiches with turkey, sauerkraut, and sandwich fixings on gluten-free bread. The toddler meal was turkey with the sandwich fixings. 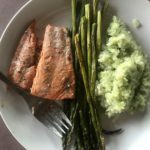 On Tuesday, I made salmon with riced cauliflower and broccoli (a recipe I’m working on!) and roasted asparagus, because it’s spring and we can’t get enough of asparagus during asparagus season in this house. But because salmon is so expensive, we could only afford to buy enough for one night for the three of us. I found some paleo-friendly chicken and basil meatballs at Costco a few months ago and keep in the freezer for times like this. I made some rice and frozen organic broccoli I also keep in the freezer. As a sauce, I used The New Primal’s The Classic marinade. It’s our first time trying it out, and we really love it. I’m not great at keeping things in the freezer for the nights we’re not sure what to do about dinner, but I’m trying to get better. Hope you have a good week! ‘Till next time!